Faster and Louder: 1,2,3,4! Dumbgums! Alright! I've got another Ramones-core band for you to check out! And this one is somewhat local to me, hailing from Philadelphia. 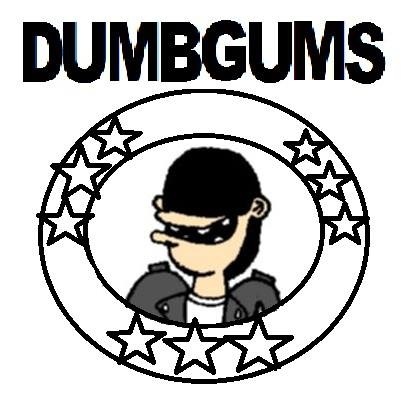 The Dumbgums, like any self-respecting Ramones-core outfit, make no attempt whatsoever to hide their true inspirations. They love The Ramones, and they aren't afraid to show it. There have been lots of bands like this over the years. Some have managed to pull off the style quite well, and others have not. The Dumbgums, in my mind, pull it off better than most. They've put a couple of tracks up on their Bandcamp page, and so far I'm totally loving what I'm hearing. Super great stuff! Sound-wise, I'd put The Dumbgums somewhere in between The Riverdales and Mutant Pop era Wanna-Bes. Their approach is classic buzzsaw punk with just the right amount of bubblegum melody to it. For demo tracks, these recordings are surprisingly crisp and well-produced. And I love some of the little touches - like the "dumb and dumber" vocal tandem and the insanely catchy hook line to "Too Innocent". It takes a special kind of genius to turn a complete rip-off of "Glad To See You Go" into a memorable and instantly likable tune. The Dumbgums have more than just a gimmick going for them - they show strong instincts for writing simple songs that will get stuck in your head all day long. And they pound out those three chords as if their lives depended on it. This is just a really fun band to listen to. These cretins have tremendous enthusiasm for what they're doing, and somehow they get away with a schtick that often seems tired or pointless when other bands try it. Admittedly, I'm reacting to just two songs. It remains to be seen if I'll be as high on The Dumbgums once I've heard a full album. But if I had to predict, I'm pretty sure I will be. Along with the likes of the Little Richards, these guys are poised to lead the next wave of Ramones-inspired pop-punk. Where are my Chucks?